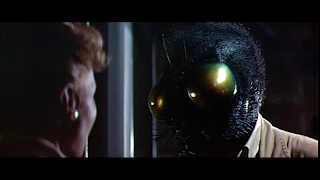 The Fly is one of those 50's horror films that I hold very close to my heart as far as films go because it was the first one of it's kind that I remember seeing. For me as a young kid I loved the monster, being older now I appreciate the film for much more than that. It's not just another Creature Feature it actually goes further than that and actually delivers a fantastic film. 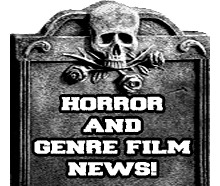 If you've seen this film before and don't want to hear what I have to say about it just skip on down to the part where I talk about the picture and audio! Review: The Fly is about a scientist who creates a machine that can transport objects from one of the booths to the other one. At first he is having some trouble with it and even loses a cat in the process. Eventually he gets the bugs worked out and he tries a guinea pig and it works. After that he decides to try himself, but things go wrong and he is infused with fly DNA. The wrap around story follows the scientists wife as she tells the story of why she had to kill her husband. 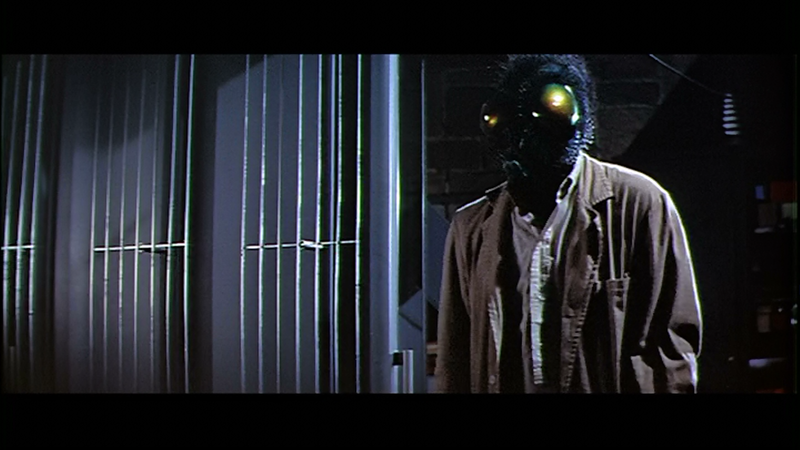 Now even though I think this film does have a pretty basic plot I think what drives it and makes it so good is the characters and how they didn't just go for a more campy angle like they did in the sequel "Return of the Fly". I actually think the characters were all very likeable and were actually well brought to screen by the actors and actresses involved. 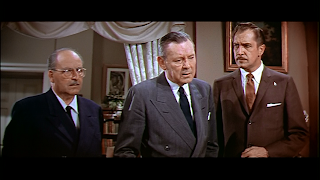 Amongst the cast there was my favorite actor of all time Vincent Price. Now during this time he was not known for his horror roles because he really hadn't done any, in ways this is what got him to go the direction of being the master of the macabre. There are two other cast members that I want to talk about as well and those are Patricia Owens and David Hedison. Patricia Owens played the lovely and caring wife Helen Delambre, she took that character and seriously brought everything to the table and made her seen very real and sincere as a character. 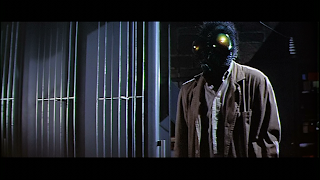 David Hedison played the means well scientist Andre Delambre and brought something to his character that made you really feel bad for him, and when he was the fly-headed man he was able to express himself perfectly with just his body language without overdoing it. Now when it comes to the special effects I think for their time they were quite frightening and unsettleing for audiences. I still think they are great, but at the age I am now they are not frightening. 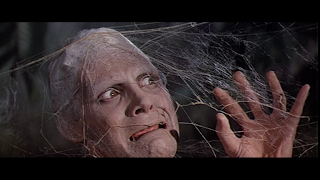 There is one special effect that they do that no matter how many times I see it I am still disturbed by it and it is the fly with the human head and arm that keeps crying for help as a spider is about to eat it. If you have never seen that part trust me when I say that it is disturbing. Of course this film is not meant to be special effects crazy so when it is shown it is that much more affective. The picture quality on this release is simply awesome! I have previously owned the two film set with this film and the sequel and I can say this is way worth the upgrade. That older release did not have any special features so the ones on this release are new to me. One thing that I can tell is that they did put some effort into making the picture look good without using DNR or edge enhancement. 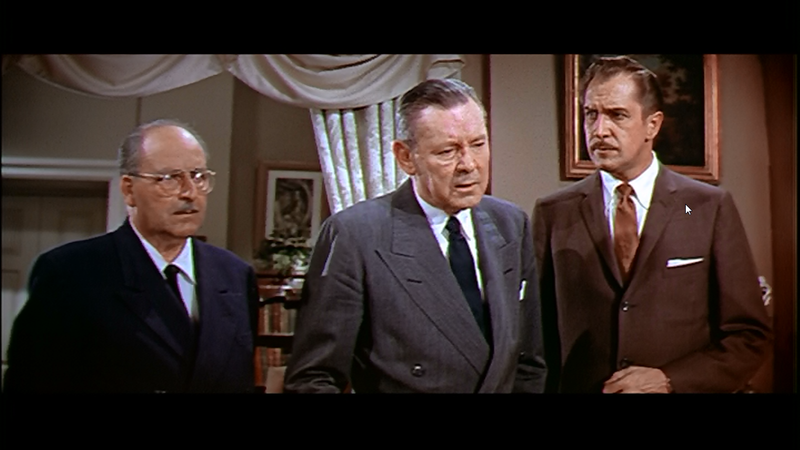 All the film grain is still intact and the detail is excellent. The audio is great as well, but I wish they would of ported over the stereo audio track as well, but in the end it still was fine if they didn't. The special features on this release include a featurette on the life and career of Vincent Price, Fly Trap: Catching a Classic, Fox Movietone News, and a commentary with actory David Hedison and film historian David Del Valle. Overall this is a great release of a fantastic film! Well worth the upgrade!